RACE is pleased to offer our All Other K9 Program (AOK9) for non-sighthound participants. The AOK9 Program is designed to be a supplement to LGRA or NOTRA-OB events and its rules are parallel to LGRA and NOTRA-OB rules, with a few modifications. It is open to all dogs which are ineligible to participate in LGRA or NOTRA sanctioned events. In September 2012, RACE joined forces with the American Preservation Dog Registry (APDR) to allow for expansion of the AOK9 program across North America and Latin America. With this collaboration, APDR affiliate clubs will be eligible to become RACE-sanctioned clubs and all APDR registered dogs will now be able to have their RACE titles recorded on their APDR pedigrees and certificates. At the same time, AOK9 events will continued to be offered to ALL dogs regardless of registration status, giving us the opportunity to have as diverse and wide a reach as possible. We highly encourage both APDR and LGRA/NOTRA clubs to consider adding AOK9 events to their racing programs! Not only is it fun for the dogs, it also offers an opportunity to increase club revenue and available helping-hands. If you are interested in holding AOK9 events please feel free to contact us. Breed Stakes - A Breed stake consists of at least 2 dogs of the same breed. Mixed breed dogs can form a breed stake with at least 2 mixed breed dogs of the same height/running style. Mixed Stakes - A mixed stake consists of at least 2 dogs of different breeds, but with the same height and running style. (2) All dogs will have two WAVEs; one WAVE will be calculated based on the dog's prior performance in breed stakes, the second WAVE will be calculated based on the dog's prior performance in mixed stakes. (3) All first time entered (FTE) dogs must be certified to race before entering an official meet. 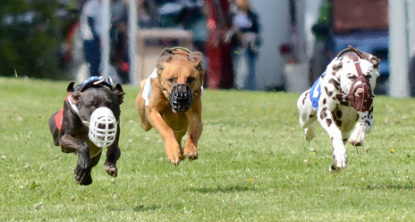 In order to become certified to race, the FTE dog(s) must complete a single run with another dog of the same breed or another dog of similar size and running style. The dog must complete the certification run with enthusiasm and must not interfere with the other dog or dogs it is running with. Dogs that have previously raced and/or have qualified to race with ABLSA, CARA, NASR or other competitive racing organizations are exempt from completing a pre-race qualifying run. Supreme Breed Race Champion (SBRC) - The SBRC title is granted to dogs that have earned 30 national points running in breed stakes. A Roman numeral (II, III, IV, V etc) will be added to the dog's SBRC title for every 30 national points accumulated over the dog's racing career. Supreme Mixed Race Champion (SMRC) - The SMRC title is granted to dogs that have earned 30 national points running in mixed and/or breed stakes. A Roman numeral (II, III, IV, V etc) will be added to the dog's SMRC title for every 30 national points accumulated over the dog's racing career. Supreme Breed Oval Champion (SBOC) - The SBOC title is granted to dogs that have earned 30 national points running in breed stakes. A Roman numeral (II, III, IV, V etc) will be added to the dog's SBOC title for every 30 national points accumulated over the dog's racing career. Supreme Mixed Oval Champion (SMOC) - The SMOC title is granted to dogs that have earned 30 national points running in mixed and/or breed stakes. A Roman numeral (II, III, IV, V etc) will be added to the dog's SMOC title for every 30 national points accumulated over the dog's racing career. The number of points a dog earns is dependent upon the number of dogs competing. The AOK9 program follows the same point schedules used by LGRA and NOTRA-OB.